Simple. Really. I mean, 5-7-5 simple. Infused with ginger and thyme, this is a subtly spicy-sweet soup that’s downright velvety—even without dairy—and perfect for a fall lunch or light supper. Start to finish, it’ll take you about 40 minutes, and most of that’s idle time while the carrots are roasting and the stock is simmering. Though I was fairly faithful to the original concept at Food52, I did make a few alts in both ingredients and process. I wanted a thicker soup, so I upped the ratio of veggies to stock. And I love ginger, so I used a bit more than called for and cut it to expose more surface area during the steeping. I couldn’t be bothered with the broiler, either, opting instead for a 20-minute oven roast. But the biggest twist was straight out of the crisper. I used the Purple Haze carrots that were in our CSA shares the past couple weeks, and to keep their brilliant colors (and brilliant antioxidants) intact, I ignored the instructions to peel. Roasted, these tie-dyed roots got even darker and sweeter. Stunning. 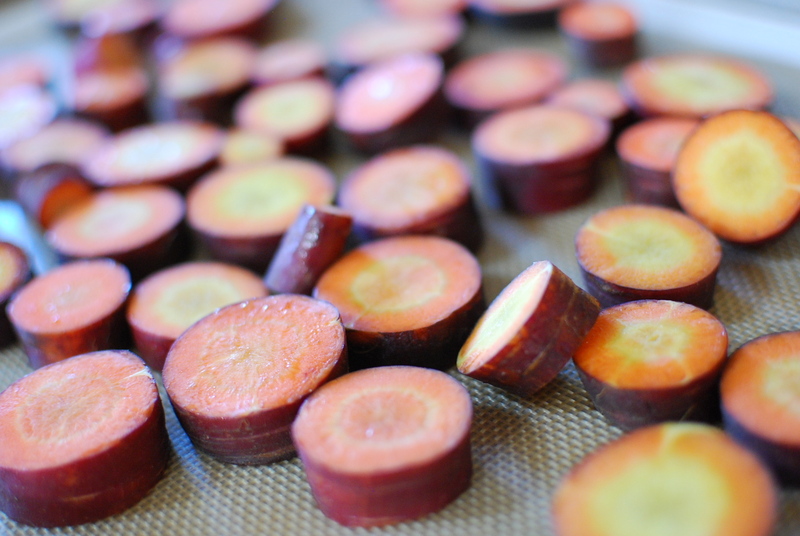 Purple Haze carrots carry the same super-antioxidants found in blueberries. 1. Cut the carrots into 1/2-inch coins and put them into a bowl big enough to allow you to toss them with 2 tablespoons of the olive oil and a sprinkling of salt and pepper. Toss and sprinkle. Spread the carrots onto a sheet pan, and roast at 400º for about 20 minutes, shaking the pan a couple times during cooking. 2. Separately, in a saucepan, heat the stock, ginger pieces, and thyme. Bring to a low simmer and steep while the carrots are cooking. By infusing the stock (instead of sautéing the pieces with the rest of the veggies), you get the root’s bite and zing without its off-putting, stringy texture. 3. Meanwhile, heat the remaining oil in a stockpot, and then brown the onion for about 10 minutes over medium heat. Add the garlic and the carrots, and sauté for another 3-5 minutes. 4. Use a spider or slotted spoon to remove the ginger and thyme from the stock. Add the liquid to to the stockpot and simmer until the carrots are soft enough to purée (probably around 10 minutes). 5. In a blender or food processor (or using an immersion blender), purée the soup until completely smooth. It’s thick – I like it that way – but if you want, you can thin it out with a little more stock or some hot water. Taste and adjust your seasonings. I added a pinch of white pepper at this point. Just a pinch. These carrots were so great, I didn’t want anything to get in their way.